Beware of those who speak and publish in opposition to God’s true prophets. Jesus responded: “Take heed that no man deceive you. “For many shall come in my name, saying, I am Christ; and shall deceive many. And ye shall hear of wars and rumours of wars: … and there shall be famines, and pestilences, and earthquakes, in divers places. All these are the beginning of sorrows” (Matt. 24:3–8). “And they shall turn away their ears from the truth” (2 Tim. 4:3–4). “That we henceforth be no more children, tossed to and fro, and carried about with every wind of doctrine, by the sleight of men, and cunning craftiness, whereby they lie in wait to deceive” (Eph. 4:11–14). Brothers and sisters, the exact time of the Second Coming is known only to the Father (see Matt. 24:36). There are, however, signs that scriptural prophecy relating to that tumultuous day is being fulfilled. Jesus cautioned several times that prior to His Second Coming, “many false prophets shall rise, and shall deceive many” (Matt. 24:11). As Apostles of the Lord Jesus Christ, it is our duty to be watchmen on the tower, warning Church members to beware of false prophets and false teachers who lie in wait to ensnare and destroy faith and testimony. Today we warn you that there are false prophets and false teachers arising; and if we are not careful, even those who are among the faithful members of The Church of Jesus Christ of Latter-day Saints will fall victim to their deception. “We can accept nothing as authoritative but that which comes directly through the appointed channel, the constituted organizations of the Priesthood, which is the channel that God has appointed through which to make known His mind and will to the world. … And the moment that individuals look to any other source, that moment they throw themselves open to the seductive influences of Satan, and render themselves liable to become servants of the devil; they lose sight of the true order through which the blessings of the Priesthood are to be enjoyed; they step outside of the pale of the kingdom of God, and are on dangerous ground. Whenever you see a man rise up claiming to have received direct revelation from the Lord to the Church, independent of the order and channel of the Priesthood, you may set him down as an imposter” (Gospel Doctrine, 5th ed. , 41–42). When we think of false prophets and false teachers, we tend to think of those who espouse an obviously false doctrine or presume to have authority to teach the true gospel of Christ according to their own interpretation. We often assume that such individuals are associated with small radical groups on the fringes of society. However, I reiterate: there are false prophets and false teachers who have or at least claim to have membership in the Church. There are those who, without authority, claim Church endorsement to their products and practices. Beware of such. Yesterday, members of the Church sustained the First Presidency and members of the Quorum of the Twelve Apostles as prophets, seers, and revelators, with Gordon B. Hinckley also being sustained as President of The Church of Jesus Christ of Latter-day Saints. He, and only he, holds and exercises in their fulness all of the keys of God’s kingdom on earth. How grateful we all are to know and to sustain President Hinckley. In plainness and power President Hinckley teaches the eternal plan of salvation, rebukes sin, calls all people to repent and accept Christ and His gospel. The doctrines of eternal salvation are not unclear or uncertain, but rather they are consistent with revealed truths, both ancient and modern. 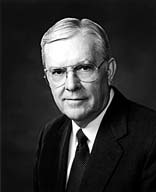 President Spencer W. Kimball reminded us that the prophets “constantly cry out against that which is intolerable in the sight of the Lord; against pollution of mind, body, and our surroundings; against vulgarity, stealing, lying, pride, and blasphemy; against fornication, adultery, homosexuality, and all other abuses of the sacred power to create; against murder and all that is like unto it; against all manner of desecration.” He continued: “That such things should be found even among the Saints to some degree is scarcely believable. … Sadly, however, we find that to be shown the way is not necessarily to walk in it” (“The False Gods We Worship,” Ensign, June 1976, 4). Therefore, let us beware of false prophets and false teachers, both men and women, who are self-appointed declarers of the doctrines of the Church and who seek to spread their false gospel and attract followers by sponsoring symposia, books, and journals whose contents challenge fundamental doctrines of the Church. Beware of those who speak and publish in opposition to God’s true prophets and who actively proselyte others with reckless disregard for the eternal well-being of those whom they seduce. Like Nehor and Korihor in the Book of Mormon, they rely on sophistry to deceive and entice others to their views. They “set themselves up for a light unto the world, that they may get gain and praise of the world; but they seek not the welfare of Zion” (2 Ne. 26:29). Of such President Joseph F. Smith warned when he spoke of the “proud and self-vaunting ones, who read by the lamps of their own conceit; who interpret by rules of their own contriving; who have become a law unto themselves, and so pose as the sole judges of their own doings” (Gospel Doctrine, 381). Now let me give you a few examples of the false teachings of those who read by the lamps of their own conceit, who, though “ever learning,” are “never able to come to the knowledge of the truth” (2 Tim. 3:7). False prophets and false teachers are those who declare that the Prophet Joseph Smith was a duplicitous deceiver; they challenge the First Vision as an authentic experience. They declare that the Book of Mormon and other canonical works are not ancient records of scripture. They also attempt to redefine the nature of the Godhead, and they deny that God has given and continues to give revelation today to His ordained and sustained prophets. False prophets and false teachers are those who arrogantly attempt to fashion new interpretations of the scriptures to demonstrate that these sacred texts should not be read as God’s words to His children but merely as the utterances of uninspired men, limited by their own prejudices and cultural biases. They argue, therefore, that the scriptures require new interpretation and that they are uniquely qualified to offer that interpretation. Perhaps most damningly, they deny Christ’s Resurrection and Atonement, arguing that no God can save us. They reject the need for a Savior. In short, these detractors attempt to reinterpret the doctrines of the Church to fit their own preconceived views, and in the process deny Christ and His messianic role. Regardless of which particular false doctrines they teach, false prophets and false teachers are an inevitable part of the last days. “False prophets,” according to the Prophet Joseph Smith, “always arise to oppose the true prophets” (Teachings of the Prophet Joseph Smith, sel. Joseph Fielding Smith , 365). “And the Messiah cometh in the fulness of time, that he may redeem the children of men from the fall. And because that they are redeemed from the fall they have become free forever, knowing good from evil; to act for themselves and not to be acted upon, save it be by the punishment of the law at the great and last day, according to the commandments which God hath given. “Wherefore, men are free according to the flesh; and all things are given them which are expedient unto man. And they are free to choose liberty and eternal life, through the great Mediator of all men, or to choose captivity and death, according to the captivity and power of the devil; for he seeketh that all men might be miserable like unto himself. “And now, my sons, I would that ye should look to the great Mediator, and hearken unto his great commandments; and be faithful unto his words, and choose eternal life, according to the will of his Holy Spirit” (2 Ne. 2:26–28). “Therefore with joy shall [I] draw water out of the wells of salvation” (Isa. 12:2–3). “If we live in the Spirit, let us also walk in the Spirit” (Gal. 5:22–23, 25). As members of the Church, each of us needs to model what it truly means to be a believing and behaving Latter-day Saint. Our example will have a powerful effect on others, making the restored gospel become much more relevant, meaningful, convincing, and desirable to them. Let us, each one, radiate to others the joy, confidence, love, and warmth of being part of the true Church of Christ. Our discipleship is not something to be endured with long face and heavy heart. Nor is it something to be jealously clutched to our bosoms and not shared with others. As we come to understand the love of the Father and the Son for us, our spirits will soar, and we will “come to Zion, singing with songs of everlasting joy” (D&C 45:71). Let us reach out in friendship and love to our neighbors, including those of other faiths, thus helping to build better family-to-family relationships and greater harmony in our neighborhoods. Remember, too often our behavior is a bigger deterrent to others than is our doctrine. In the spirit of love for all men, women, and children, help them to understand and to feel accepted and appreciated. Let us remember that it is our duty to be faithful to the restored truths of the gospel of Jesus Christ. It takes faith﻿—real faith, total and unreserved﻿—to accept and strive to live prophetic counsel. Lucifer, the adversary of truth, does not want us to feel or exhibit that kind of faith. He encourages disobedience, planting defiance in the hearts of the unwary. If he is successful, they will turn away from the light into the darkness of the world. Our safety, our peace, lies in working as hard as we can to live as the Father and Son would have us live, in fleeing from false prophets and false teachers, and in being anxiously engaged in good causes. I know that God lives. Jesus is the Christ. The restored gospel is true, and there is great joy in being anxiously engaged in this true and holy work. Of this I testify in the name of Jesus Christ, amen.